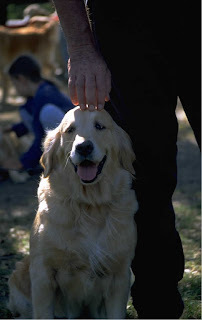 All Things Dog Blog All Things Dog Blog: "Hello Fido! And What Was Your Owner's Name Again?" "Hello Fido! And What Was Your Owner's Name Again?" We've all been there--we remember the dog's name before the owner's. What do you suppose it is that causes that brain dysfunction? I have a theory. For years I've noticed that I can remember a person's name after meeting them twice--well, maybe 3 times. I've come to believe that it's all about having the time to assign some personality characteristics to the person, so that I can associate all this with the name. Think about it. It's much easier to associate a Bloodhound with the name Hunter because of the obvious correlation, or even a Chihuahua with the name Bruiser, just because it's funny. The variations in dogs' appearances are far greater than ours as humans. Sure, we have boys and girls, older and younger folks, brown hair and blonde, short and tall, small and large. But somehow those same variations are more obvious with dogs than with humans. I can't explain it, except that it seems to be a commonality with everyone I toss this theory out to. Everyone seems to feel it's on target. What about you? How do you remember an owner's name as well as their dog's name? Let's get some conversation going here. I need help--big time! My neighbors may be feeling a bit slighted when I remember Lola and don't remember...."What was her name?" Ideas? We hold lots of social events for pets & owners. Name tags with pet & owner's names on them help to solve this very common "problem". I'm glad I'm not the only one who does that! I'm much better with dog names! It even happens when we don't know the dog's name. There are even some houses we drive by and we'll describe the house to each other as "the house where the Rottie mix lives"...not "the brick house with white trim." I totally get that, Paris. I really need to work at it, but I'm so name-challenged! Anybody out there have suggestions? Quick you silly Humans, get out the language tape! Learn "dog speak" and you'll understand us when we tell you our Humans name! What do y'all mean there is no language tape for "dog speak"? I couldn't help but start laughing as I was reading this, because it's so true -- and I've been on both ends of it. You wouldn't believe the number of times I've been called, and was introduced as, "Toby's Mom," (especially at BlogPaws) because they don't know who I am, but know my dog. And, it was for those exact reasons, that I changed our twitter profile to a picture of Toby and me for Global, since Toby wasn't going to be there, and I wanted people to recognize me. I have no help for you. I can remember the dogs names way better. But then when you're in the park the names get repeated and repeated and repeated. Maybe its the same old trick for humans. Just repeat it ridiculously. LOL! So true! I always remember the dog's name, and then that person is "Fido's Mom" or "Hunter's Dad." For some reason, it's so much harder to remember the person's name!